At the end of the Group Stage, two teams defended their title and six teams emerged as newly-crowned Legends. They’ll battle this weekend as the ELEAGUE Major enters the Playoffs! 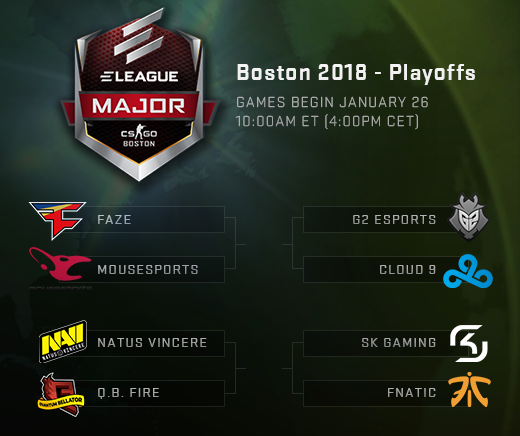 Watch live coverage from Boston’s Agganis Arena beginning Friday at 10:00am ET (4:00pm CET) on the official Twitch stream (or in game on GOTV) to see which team will become the next CS:GO Major Champions! Don’t forget to make your Playoff picks now in the Pick’Em Challenge before the matches begin tomorrow.